Driving on Arizona Hwy 169 we pass a sign for W. Cherry Creek Road which my MVUM calls Forest Route 372. 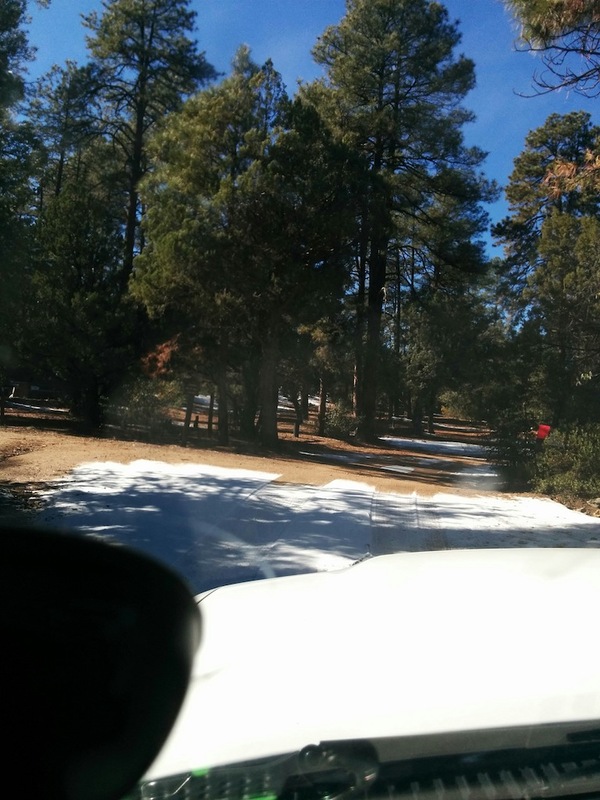 We have heard of the Powell Springs Campground in the Prescott National Forest and this road will take us there so we decided to check it out. As our intrepid Tacoma carries us and our gear up the winding, barely two lane road we quickly get to areas where there is snow hiding out in shady nooks and crannies. Near the top of the hill we arrive at the Powell Springs Campground and turn in. It’s a nice, clean, woodland camping area with snow on the ground and no one else present. As we’re drive the short loop looking for a suitable campsite, tires crunching on snow, it dawns on me that we’re at 5300′ and it’s cold. Plus, there is no AT&T signal here and it’s been a week since we checked our email or made a blog entry or knew what was going on it the Big Wide World. I’m having withdrawal symptoms. Had we arrived within a day of getting our online fix we would have braved the cold but since it’s still early in the day we decide to push on father down this little road towards Cherry that has taken us this far and see what we see. We’ve put Powell Springs Campground on our “next time we’re in the area” list. Looking at the map I see Cherry but there is not much there. It looks like a blip on the map. Not knowing what to expect we eventually roll into the town. I say town but I really mean hamlet. There can’t be more than 30 people who live here. It looks like one, short, main drag of all of an eighth of a mile. We slowly roll past a ranch for sale, a small clothing store, one tiny Bed and Breakfast and then we are out of the “downtown.” By this time the road has become a nicely maintained dirt surface although one wonders what it will become once the rainy season takes hold. We wander back and forth as the road cuts its way along the side of a mountain and we can look down into the little valley that houses the outskirts of the hamlet. There is no railing so one slip up and we’re taking an almost vertical plunge of a couple hundred feet, at least. At one corner there is an unofficial little road heading off to the right and as I look in that direction I see what at first appears to be the remnants of an old house foundation. We pull off the “main” road, into that side road and park so we can take a look. 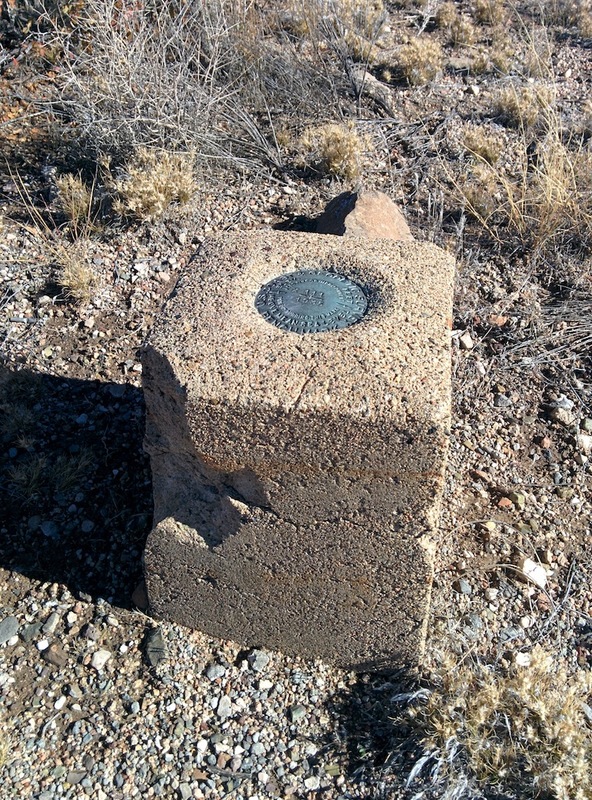 We find that it is not a foundation piece but instead an old Geodetic Survey Marker. 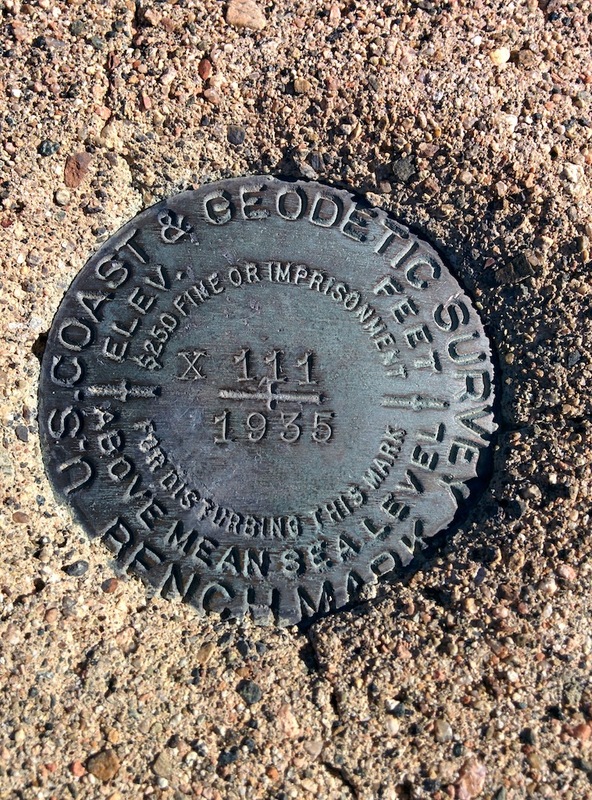 Interesting so I save a GPS waypoint mark, call Willow back from her sniffin’ and pissin’ and we keep heading down the road towards…well we’re not quite sure so we really are adventuring. 15 minutes later at the bottom the hill we find an area that Yavapai County uses to store piles of different size rock products for road and culvert repair we’re guessing. Piles from small car size boulders to fine gravel. I find a lot of weird things “interesting” and consider taking a quick look. It’s wide open but there is a “County Property Stay Out yadda yadda” sign and see no need to trespass for some piles of rocks interesting or not so we stay to the left and keep on down FR372/W a.k.a Cherry Creek Rd. 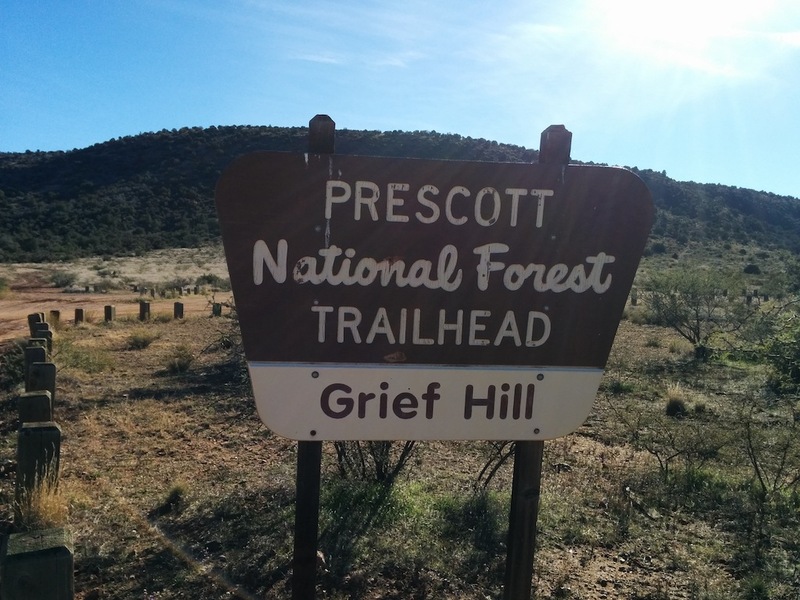 About a mile from our thwarted geologic investigations we see a sign for something called Grief Hill. Great name. We decide to check it out. Two empty horse trailers were there and we walked around the area for a few minutes attempting to find a geocache. Presently two riders approached and I called Willow back to my side so as not to concern the riders or their horses. Willow does fine around horses now. The main thing she had to learn was to not jump up to reach the horse’s face for a sniff, instead let the horse bend down to sniff you. Once we figured that lesson out everyone (horse, canine and human alike) was happier and less stressed. I asked if she could meet their horses and the riders agreed. She calmly approached each horse, one at a time and was perfect in letting them come down for a mutual sniff. I asked if I could peel off a couple of pieces of chestnut from the horse’s legs as a doggie treat (yes, I know, disgusting, but there is not a dog on the planet who doesn’t find a piece of that irresistible and it doesn’t hurt the horse). They smiled knowingly, said yes and so both Willow and their dog got a special, stinky, chewy treat. No kisses for her after that for a while. We said our thank you’s and goodbyes and headed the last little way down the hill into Camp Verde to continue on our adventure. PrevLayering. It’s all about Layering.